Taman Mini Indonesia Indah (TMII) or Beautiful Indonesia Miniature Park has the most museums in Indonesia. Presently it has 16 museums ranging from fauna, history, cultures, to science. Some of the museums look like the ordinary museums with many exhibits, but the museums on flora and fauna are combined with parks where we can learn more about the living creatures. Even some museums allow us to play with some displayed instruments to learn the impact. If we look closely, the look of each museum represents its theme. For example, the Power and New Energy Museum looks like an atomic structure, i.e. one proton surrounded by three electrons. Another example is the Sport Museum that has a giant soccer ball on its dome. Therefore, next time you visit Taman Mini Indonesia Indah, can you guess what is the museum without getting hint from the map or the name at front? We start the journey to Taman Mini Indonesia Indah museums with Purna Bhakti Pertiwi Museum, which is located next to the main gate. This museum is dedicated to the former President of Indonesia: Mr. H. M. Soeharto. The collection of this museum is approximately 13,000, most of them are the souvenirs he received. For example, a sword from PLO leader Mr. Yasser Arafat, a crystal sword from Croatian President Mr. Franjo Tudman, silver plates from Kazakstan President Mr. Nursultan Nurbayev, and replica of Chinese princess bed made of jade from Yunan, China. This museum is a memorial of our ancestors' bravery in many battles against colonization from VII to XIX century. The building looks like a fort surrounded by water. The water representing Indonesia as a maritime country. There are two popular traditional boats there: a traditional boat from Banten and the phinisi from South Sulawesi. This museum exhibits traditional and wedding costumes from every province in Indonesia, traditional ceremonies shown in dioramas, as well as local products and arts, such as batik, songket, paintings, etc. The Information Museum or Museum Penerangan in Bahasa Indonesia exhibits the history of providing mass information in Indonesia, from the traditional one such as wayang suluh (presenting information through puppet performance) until the modern era of printing and television. This museum is called Museum Minyak dan Gas Bumi Graha Widya Patra (Gawitra) in Bahasa Indonesia. Since oil has been one of Indonesia’s important assets to develop our country, this museum was built to commemorate 100 years of the oil and natural gas industry in Indonesia. The building looks like an offshore rig. Inside we can watch short movie and slideshows about the history of oil exploration in Indonesia. This museum has more than 600 exhibitions, both inside and outside of the building. 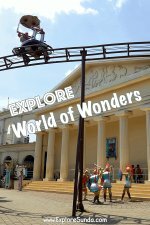 It is a unique museum in Taman Mini Indonesia Indah because we are allowed to try or watch the experiments. For example, there is a demonstration of sun-stove, where the energy to cook comes from the heat of the sun or we can try to play a magic harp (a harp without strings since the strings are replaced with infra-red rays). This museum has a collection of thousands of stamps from all over the world. It also provides information on the history of postal services, in the world as well as Indonesia, represented by several dioramas and pictures. The Komodo museum showcases Indonesian animals in preserved form. They are displayed according to their natural environments. You can find this museum easily in Taman Mini Indonesia Indah since it looks like a giant komodo. Komodo is an extinct animal live in Komodo island, in Lesser Sunda Islands. A Reptile Park that is integrated to this museum was opened in April 2001. The Reptile Park exhibits live reptiles. We even can touch a phyton in the Touch Park. The oldest train in Indonesia. It was made in England in 1880. The red double decker bus, called "Si Jangkung Merah" (=the tall red bus). 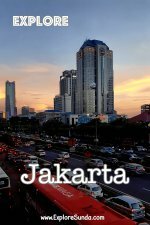 It was operated in Jakarta from 1968 to 1982. The old Garuda Indonesia Airplane manufactured in 1979. It was a DC9 made in USA. A Search and Rescue (SAR) chopper made by IPTN (Indonesia), manufactured in 1982. A traditional Jayapura boat, used for sea competition in 1995. Miniatures, pictures and diorama for other mode of transportations that are too big to be displayed in this museum. Transportation Museum has a Traffic Park as streets simulation, complete with the traffic lights and signs. Children can rent mini becak, bicycle or car and ride them as if they are in the real streets. It is used as a recreation facility while learning the traffic rules. This is the only place in Taman Mini Indonesia Indah where we buy one ticket to enter two places of interests: the Fresh Water Aquariums and the Insect World. They are categorized as museum, but actually they are not purely museum. 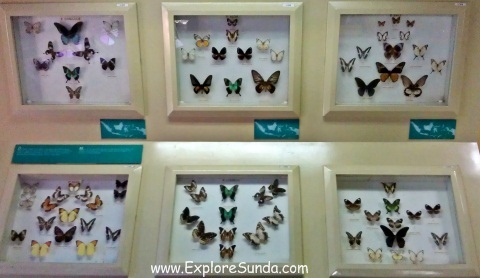 The Insect World is a museum of insects. 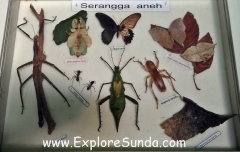 There are thousands of preserved insects there, in various sizes. Our family favorite is the butterfly. They are so beautiful and each area in Indonesia has its own distinctive butterflies. There is a small butterfly park at the back of this museum. If you are lucky, you will see many butterflies there. Butterflies are day creatures, hence, they tend to be more active in the morning. The latest addition to this place is several small animals in cages at exit door of the butterfly park, such as squirrel, oppusum, lizard, mouse deer and tarsius. But I am not sure how these animals relate to the theme of insect world. As the name implies, we can see various live animals from the fresh water in the Fresh Water Aquariums. The building is round and there are simulation of river and brackish ecosystems at the center of the building. Most of the displays are fishes, both local fishes and foreign fishes. Each aquarium has a label informing the name of the fishes and their origins. We also can find rare fresh water creatures here. Fresh water lobsters, salamander, and albino softshell turtle are some of them. Both Fresh Water Aquariums and Insect World provides training for people who want to learn how to breed and grow ornamental fish, catfish, prawn, lobster, as well as insects. This museum preserves and exhibits traditional weapons all over Indonesia, including the legendary weapons from centuries ago. Asmat is a name of a tribe living in Papua, eastern part of Indonesia. Thus, the Asmat Museum is dedicated to exhibits the life, art and cultures of Asmat people. Some of the collections are traditional clothes and jewelry, mbis pole (the ancestor's statue), hunting tools, and tifa (percussion instrument). We also can see their modern art based on market demands without foregoing their unique traditional patterns. It exhibits traditional games as well as Indonesia achievements in world sports, such as Olympic, Asian Games, Everest team of Indonesian army conquering Himalayan mountain and tall ship races by Indonesia navy driving a tall ship named Dewaruci. This museum exhibits the history of telecommunication in Indonesia, from the traditional one made of bamboo to the modern ones in the digital era, such as satellite, internet and video conference. We can learn many aspects of Moslem in this museum. Bayt al-Qur'an means home of al-Qur'an, hence, it exhibits all things related to al-Qur'an. On the other hand, Istiqlal Museum exhibits Moslem cultures in the form of arts, architecture, etc. Initially this was East Timor pavilion, one of the province in Indonesia. In 1999 East Timor was separated from Indonesia and formed its owned country. Hence, Taman Mini Indonesia Indah decided to change the status of the pavilion to become a museum. Museums in Taman Mini Indonesia Indah keeps growing. 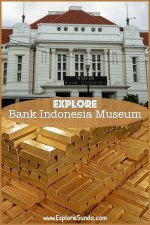 Last time we went there in August 2013, there are two new museums under constructions: Haka Indonesia Museum and General Ceng Ho Museum. Both are located in Tionghoa Cultural Park. You may click any of the image below to continue reading about pavilions, recreation, park and facilities in Taman Mini Indonesia Indah.